Lynn Loring began appearing on Search For Tomorrow at age 11. 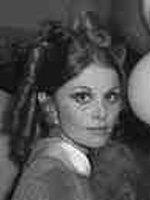 She appeared in several series but gave up acting in 1975 to pursue a career in production. Ms. Loring acted in 2 of my favorite episodes. Her skillful acting most definitely contributed to both these episodes being so memorable.